The International e-Navigation Underway conference took place on-board the DFDS cruise ship “Pearl Seaways” voyaging between Copenhagen and Oslo January 24-26. 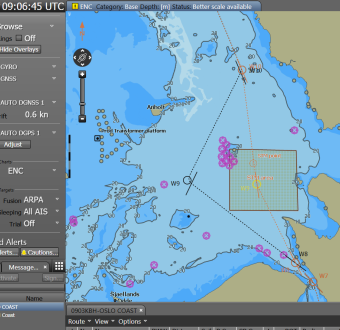 This year the conference ship is part of the Sea Traffic Management (STM) Validation project using e-Navigation solutions. Conference delegates visited the bridge to see the Wärtsilä NACOS Platinum ECDISPILOT send the ship’s Voyage Plan to the VTS in Norway, having a Kongsberg system, and to a shore centre in Sweden, using a Saab system, and receive current safety information back.